The brochure "Beyond Election Day: Best practices for follow-up to EU Election Observation Missions" was launched at the European Development Days on 8 June 2017 in Brussels. Election Observation Missions (EOMs) are a highly visible demonstration of the European Union (EU)’s commitment to supporting democratisation and promoting respect for human rights across the world. EU EOMs’ immediate goals are to strengthen confidence in the elections, deter fraud, and provide an informed and factual assessment of an election process. Their longer-term objectives aim at improving the overall election framework and the context in which elections are held, strengthening the independence and accountability of state institutions and enhancing the resilience of partner countries through supporting good governance. The recommendations issued by EOMs can be instrumental in improving future elections and, more broadly, can be a crucial element in the deepening of democracy. The EU is committed to following up EU and OSCE/ODIHR EOM recommendations systematically and has for several years undertaken a wide range of actions to advance and promote these recommendations as well as those made by EOMs organised by our partners. The second Action Plan on Human Rights and Democracy (2015-2019) requires consolidating best practices for leveraging EU and OSCE/ODHIR EOM recommendations in EU and EU Member States political dialogues and democracy support activities. 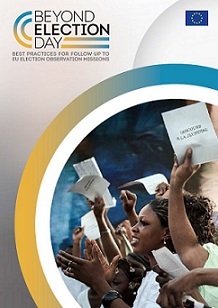 For this purpose, the brochure "Beyond Election Day: Best practices for follow-up to EU Election Observation Missions" was launched at the European Development Days on 8 June 2017 in Brussels. This brochure presents the political and operational tools used by the EU at headquarters and in the field, where EU Delegations have been actively engaging with the authorities to support the implementation of EOM recommendations. The tools include: political and other formal dialogues, operational tools including programming instruments, the deployment of purpose-designed visits and missions, public diplomacy and work in international fora. Also the brochure highlights the important contribution that the European Parliament (EP) makes in promoting the implementation of EOM recommendations. The EU’s international governmental and non-governmental partners are also actively engaged in following up on electoral recommendations and other activities aimed at improving electoral processes. This brochure also examines initiatives by these partner organisations that can inform and inspire the EU’s approach to EOM follow-up where appropriate.